Two of the birthstones for August are Peridot and Sapphire. September stones include sapphire and agate. Peridot is a symbol of fame, dignity and protection. It is the anniversary stone for the 16th year of marriage. It is said that it can increase strength and physical vitality. It can protect against nervousness and aids in healing hurt feelings. Physically it helps liver and adrenal function and is thought to protect lungs, sinuses, and wrists from illness and injury. Mystically it helps dreams become reality. It is believed to attract love. It calms a raging anger, dispels negative emotions, and promotes sleep when worn to bed. Legend has it that pirates favored it to protect them against evil. It brings the wearer success, peace, and good luck. All have sold. I don't have any sapphires, but I do have a pretty dark blue chalcedony that could work for a September Birthday. Sold. Chalcedony is a variety of quartz. It is believed to banish fear, hysteria, depression, mental illness and sadness. Chalcedony reduces fever. Wearing chalcedony is believed to be excellent for eyes. Mystically chalcedony prevents from touchiness and melancholy. It is worn by many to promote calm and peace. Chalcedony also stimulates creativity. And I have several agates that would make lovely birthday gifts. Sold. The one below has also sold. Agate is a cooling stone. It reduces fever, quenches thirst, and is beneficial in stomach area. It quiets pulse and heart throbs and insures good health and a long and prosperous life. Mystically it guards against danger. It has grounding, centering and balancing properties. Wearers become temperate, continent and cautious. It helps one view themselves with more clarity and see the world through a broader viewpoint. Wearing agate is believed to cure insomnia and to insure pleasant dreams. Moss Agate (the three bottom photos): Aids circulation, pancreas & pulses, and blood sugar balance. Mystically it is believed to create abundance, success, and prosperity. This protective stone is also known to boost self-confidence and self-esteem. It stimulates perception, awakening an individual to the truth of a situation. It works on healing bitterness and pain caused by events in the past and fosters the courage to pick ones self up and start again. As always this information is presented here for fun and is not meant as medical advice. These first two are agates mixed with glass seed beads. All have sold. 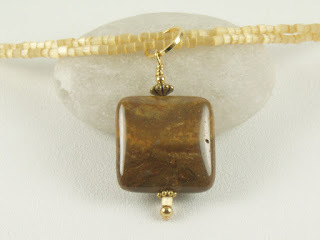 This is an ocean jasper pendant mixed with green and gold glass seed beads. Sold. And the last 3 are Owahee jasper. Again mixed with glass seed beads in colors to complement the pendants.Sold. A busy day working on restocking my necklace inventory. I put a large dent in my supply this past weekend! Things don't stay around long enough for me to list in my online store, so if you see something you like posted here send me an email. Agate with glass and pewter. Sold. My mess after a day of work. Stones for tomorrow ready and waiting! Green opal, glass seed beads and copper - both now sold. Green opal, glass and copper. All have have sold. Chalcedony and sapphire blue glass seed beads. Sold. Pale blue agate with teal hex cut glass seed beads and pewter. Now sold. Today I traveled down to Gig Harbor to shop at Gig Harbor Beads. I had received an email last week that they were having a gemstone and pearl sale. I do not usually frequent bead stores as I need to buy in large quantities and at really low prices in order to keep my prices so reasonable. Gig Harbor Beads is an exception to that. I like their selection of stones and several times a year they have really good sales of 50% off. Also the owners are very pleasant to deal with. I discovered today that they will be closing by the end of the month. That makes me sad, another local business bites the dust. I bought twice as much as I had planned because they have some unusual stones and I don't know where in the area I will be able to find such things again.When buying stones I like to see them in person and hand select each one. No online stone shopping for me. I hope I can afford to go back again before they close their door. The grey and black are zebra jasper. They will be nice pendants mixed with black and grey seed beads. The other stone is feldspar agate. I can see the small squares as earrings and in bracelets. The long rectangles will make interesting pendants. This is one of my favorite stones. Green opal. It is the matrix that gem stone opal is found in. You can sometimes see tiny flecks that pick up the light. Those are shards of gemstone opal. I have 3 more large ovals that I will use as pendants. I can see using the larger of these new medium sized ovals as small pendants and the smaller ovals as earrings and in bracelets. So far I have been mixing this stone with copper and various shades of brown seed beads. This bunch has some very pretty green stones in it too so perhaps they will steer me in a different direction. The 4 greyish stones are needle agate. Very interesting designs. The rest are an assortment of agates. Look at the variety of colors!! I love this color combination!! The stone, Owahee Jasepr, is found in NE Oregon. Trivia: This stone is said to assist with healing of animals, dissipate energy blockages, activate hand and foot chakras, and promote connections to your senses. It also attracts genuine friendships, keeps the wearer grounded, protects travelers, and reduces stress. All have since sold. The jasper looks so soft and soothing. Each necklace has 2 strands of glass seed beads and the bracelets have 3 strands. All use copper beads and toggle clasps. The earring earwires are copper. To see them in person come and find me in Seattle tomorrow in Occidental Park or in the Magnolia neighborhood at their summer arts festival Friday and Saturday.